Blog / Temporary warehouses: what kind of structures do big brands choose when they need more storage space? Temporary warehouses support large companies in managing the stock of goods, products and equipment. Which structures do the major brands choose when they need more space to store their goods? Many leading manufacturers or resellers often need additional space to store their goods, products, or equipment. In many of these cases, retailers choose to expand their storage areas using mobile or temporary warehouses. But what are the reasons that make this choice a winning one? 1 - Many retail companies often store their goods in warehouses provided by their parent company, thus bearing rental expenses. This often happens because the financial resources and time limits for the physical construction of a structure that can be used as a warehouse are too high and restrictive. A mobile warehouse, on the other hand, is a cost-effective, reversible, and quick choice to make. They can be used once they are actually needed and for a period of time that doesn't have to be established in advance or based on the specific business needs. Examples of this may be the need to expand a workshop and use a temporary warehouse to house production tools or material stock, or to plan a different positioning of products to optimise logistics activities. Using a temporary warehouse means being able to better manage seasonal peaks without running out of goods. Any experienced retailer is aware that if buyers don't get what they want when they want it, they'll go elsewhere, and when they do, there's always a chance they won't come back. 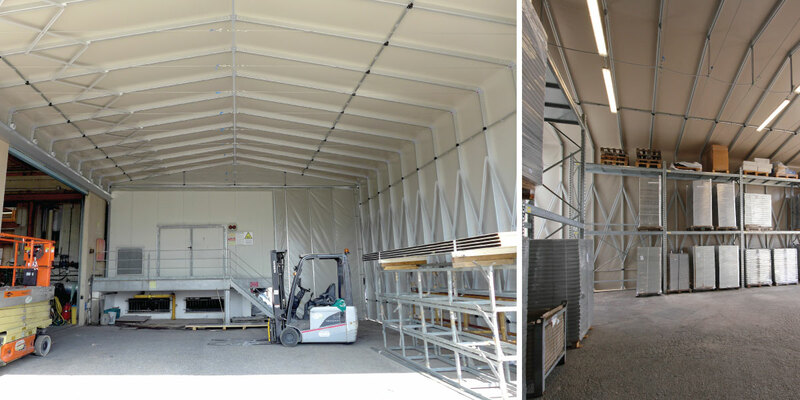 Taking advantage of a temporary structure that is easy to install, close, and remove is a choice that can bring added value to the entire business, both in terms of logistics, and in terms of customer satisfaction. It is perfectly suited to meet the varying seasonal needs. 3 - The purchase of a temporary warehouse by Giulio Barbieri S.r.l. is a turnkey solution. A temporary warehouse of the Barbieri range offers the possibility to quickly create a ready-to-use storage area without any hidden costs, with a turnkey project. The retractable aluminium tunnels are installed within one day by our expert staff, allowing you to immediately use the structure for the intended purpose. The decades of experience in the logistics and industrial field allows the company to meet and solve the customer's needs even with special individually tailored projects.